Cask Global Canning Solutions – the inventors of micro-canning equipment for craft brewers – has released a new canning line. 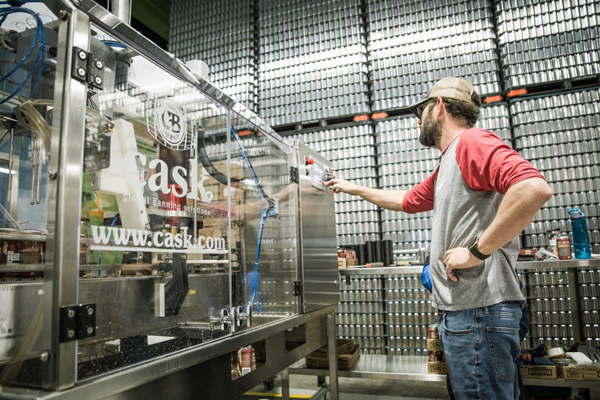 Cask’s new Micro-Automated Canning System (mACS) packages both carbonated and uncarbonated beverages. According to the company, the mACS also fill cans of varying heights and diameters — from 5.5 ounces (163 mL) to 19.2 ounces (568 mL) in volume — and the changeover between cans can be done in less than 30 minutes. Dead Armadillo Craft Brewing (Tulsa, Oklahoma) is now using the mACS to can its beer and a new product. The mACS has electric cam-driven seamers, three CO2 pre-purge heads, three fill heads, and a post-fill rinser and dryer. It measures seven by 2.5 feet and has a footprint of 17.5 square feet. It has a recipe memory feature that automatically sets the fill settings for speedy transition between different beverages. The mACS conveyor belt can feeder (as found on Cask’s larger ACS machine) allows for adding such automated pre- and post-packaging components as a depalletiser, inline date coder, nitrogen doser, pressure-sensitive labeler, shrink sleever and other components. The machine’s filler technology combines fill-level sensors with proprietary foam-control valves. Those features produce filled cans with low dissolved oxygen pickup of 5-20 parts per billion. The mACS are said to fill 25 cans per minute and 60 cases per hour with one operator.